Fifa has officially authorised the wearing of head covers for religious reasons during football matches. The ruling was made following a meeting of the International Football Association Board (IFAB) in Zurich and will apply to male and female players. The wearing of head covers had been banned, but a two-year trial started in 2012 has proved successful. "It was decided that female players can cover their heads to play," said Fifa secretary general Jerome Valcke. The International Football Association Board was founded in 1886 "to discuss and decide upon proposed alterations to the laws of football"
"Male players can play with head covers too. It will be a basic head cover and the colour should be the same as the team jersey." 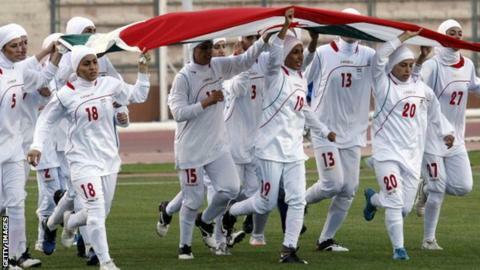 In 2011, Iran's women's team withdrew from an Olympic qualification match against Jordan in protest at not being allowed to wear headscarves. There have also been calls from the Sikh community in Canada for the ban on the wearing of turbans to be lifted. World football's governing body, Fifa, had claimed the wearing of head covers while playing competitive football posed too great a risk of injury to the head or neck. However, following a request from the Asian Football Confederation, the IFAB allowed for their safety to be tested during the trial. At the annual general meeting at Fifa's headquarters, IFAB members also voted to introduce a new law that will punish players who display messages on T-shirts underneath their club's kit. The rule change, which will come into effect from 1 June, amends Law 4 of the game, which relates to players' equipment.